BRS, through its associate boiler rental suppliers, will assist in emergency and planned rentals to minimize or eliminate disruption in operation. Who supplies the fuel and power for the boiler? Who supplies the main gas pressure regulator? Who provides the insurance for the boiler? Who is paying for the freight? Who will hook up the boiler and what needs to be done? The fuel and power supply for the boiler are the responsibility of the Lessee. BRS also secures portable generator sets if you require power for your application. Trailer mounted units up to 350HP have oil storage tanks on board. Those units require the tank to be filled after the trailer is blocked and leveled. All oil MUST be removed prior to return of rental boiler. Units larger than 350HP will require a separate oil tank to be provided and filled. Many times a local fuel supplier can provide this tank at little or no charge when purchasing oil. An oil transfer pump may be required depending on the location of the oil tank. The trailer power requirements are 240/460 Vac, three phase and 120 Vac, control. Note that some units have separate control power transformers and do not require 120 VAC power. If power is not available, portable generator sets can be provided. Typically the Lessee provides the gas pressure regulator to supply trailer with proper pressure. If required, BRS sells gas pressure regulators for your application. Advise the sales department when you place your order or are inquiring about a price. It is the responsibility of the Lessee to provide full protection for the boiler and equipment. Check with your insurance agent, many policies will cover this with no increased premiums or extra charges involved. A certificate of insurance will be required prior to start-up. The Lessee pays the freight to the site and the return of the unit after the rental period. Trucking arrangements are made by BRS or Lessor and will be coordinated with the trucking company. The hook-up of the boiler will be done by the Lessee, which includes the following tasks before a start-up technician is called. Unload and level the boiler unit or level and block the tires for trailer mounted units. Connect the 3 phase and 120 Vac control power as required to the safety disconnects. Provide make-up water supply to the feed connection. Minimum of 40 psig. 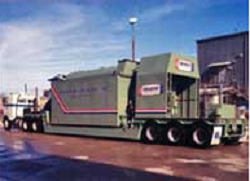 Provide steam piping from the trailer to the process connection. Provide a regulated natural gas service or PROPERLY REGULATED propane tank for 200,000 BTUs pilot gas. Supply and fill oil tank when burning #2 oil. Gas pilot required when firing oil. Provide condensate return piping. This is not required, but returning condensate will reduce make-up water usage and reduce energy cost. Pipe any drains to safe areas, water and steam is a hazard to personnel or property. Local code MUST be consulted. Chemical treatment for the boiler must be provided for any length of rental. The Lessee must provide the proper chemical treatment program. Proper blow down of the equipment and treatment will prevent damage to the boiler. BRS can provide the proper boiler chemicals and chemical treatment services at start-up and during the rental period. Please advise when the lessee does not want the responsibility of chemical treatment. BRS also has a third party chemical treatment company that can also provide chemicals and services when needed. The BOILER ROOM hosts a soiree of events that are always new and exciting. This place is a unique venue and has played host to countless bands. It is the home to a showcase of Rock, Blues, Metal, Pop, Punk, Electronica and many other genres that are considered “loud” by nature. The guest artists make the event more enjoyable. Many bands and artists had performed here. People aside from the place itself go here because of the music and the bands. Here are the list of upcoming events this month of June.